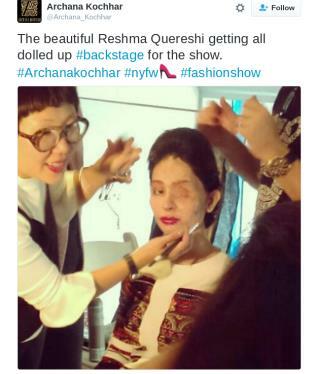 (Newser) – Two years ago, Reshma Quereshi was permanently disfigured in an acid attack while walking to school in India. She was only 17. On Thursday, she walked in New York Fashion Week, ABC News reports. According to the Independent, Quereshi was held down by a group of men, including her sister's estranged husband, who poured sulfuric acid on her. The acid ate through the skin of her face and cost her an eye. For a year following the attack, she was suicidal. Then she became the face of Make Love Not Scars, a nonprofit fighting acid attacks. The organization's videos featuring Quereshi have been viewed by 1.3 million people, Reuters reports. "Quereshi broke down in tears". Don't they mean tear? Acid attacks? I hope the perpetrators were sentenced to ten years at hard labor, working in the broiling heat and humidity of southern India.